Hon BILL ENGLISH: I can inform the member that the Minister recently visited a programme set up under the last Government where children were taken out of school for 6 hours a week to pat dogs in the animal shelter, providing animal therapy—whether to the children or the dogs, I am not sure. The parents and the children involved were as mystified about the outcomes of that Government-funded programme as the Minister was. I can assure hard-working New Zealanders that under a National Government such spending will not continue. That's a cheap shot. Within the context of having the government run our lives, which we seem to be stuck with in the meantime, there are some children who can benefit from spending time with animals in order to develop empathy. Sure it's not ideal that the need even exists but there's plenty of other MSD expenditure that should be well up the chopping list. The kind of expenditure that creates disaffected, neglected, unloved, angry children in the first place. Each fortnight, Sputnik and other children from the centre get to train and feed an SPCA puppy. 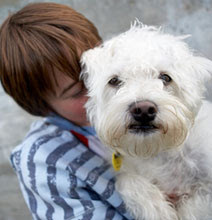 Trainers sit with the children, many of whom are victims of abuse, to teach them how to handle the puppies. I am a great believer in the power of animals to positively influence lives. Last night the Criminal Investigations (Bodily Samples) Amendment Bill passed its first reading supported by all but the Greens and the Maori Party. TV3 reports the voting was 108 - 13 (one missing). I am still hoping that ACT (and Labour for numbers) will not support this bill further down the line. It is entirely at odds with ACT's claims to classical liberalism. It is an extension of the powers of the state against the rights of the individual. All sorts of excuses can be made about the rights of the majority or existing contraventions of individual rights making this development acceptable, even ho-hum, but I am sticking to basics. As I have no other post this morning I will continue yesterday's. Redbaiter says that my criticism of the written questions fiasco is "nit-picking and piffling" and an "over eager beat up." No, it's not a beat-up Redbaiter. It is an expression of frustration at the extensive and expensive time-wasting (on both sides) that goes on in parliament. And the obstructiveness extends into the ministries and their handling of questions put under the Official Information Act, as identified and criticised by the Ombudsman late last year. Game-playing by some bureaucrats to delay the release of public information has been criticised by the ombudsman. Chief Ombudsman Beverley Wakem said there was a growing tendency by some government departments and ministers' offices to delay providing requested information within legal time frames. "While in some cases this was clearly a misunderstanding of their obligations, there is also a regrettable tendency to game the system and delay responses until the complainants' interest in the matter had passed." You may be happy paying for the "game-playing" that goes on in parliament and the public service. You may think ready access to information of no account. I can't agree. People are waxing lyrical about Speaker Lockwood Smith's new regime. Lockwood will make Ministers answer questions properly, they are saying. Well I hope he plans to include written questions. Here's a smattering of answers from the Minister for Social Development. The spelling mistakes are not mine. Comments are interspersed. 8749 (2008). Hon Annette King to the Minister for Social Development and Employment (15 Dec 2008): Will she guarantee no frontline staff will lose their jobs as a result of her holding the Ministry of Social Development to their target of 5% overall reduction in staff numbers in the next 4 years? Hon Paula Bennett (Minister for Social Development and Employment) replied: The question the Member asks relates to operational and employment matters, which are the responsibility of the Chief Executive. Evasive. If Ministers have no input into operational matters why did we bother changing government? 8692 (2008). Hon Annette King to the Minister for Social Development and Employment (12 Dec 2008): How many staff are employed within the Ministry of Social Development, by section and occupation, at 12 December 2008? Hon Paula Bennett (Minister for Social Development and Employment) replied: I am advised that the number of staff employed by the Ministry of Social Development is regularly raised as part of the Annual Financial Review and Estimates Examinations of the Ministry of Social Development by the Social Services Committee, which are both available from the Parliamentary Library. I do not have access to the Parliamentary library. These answers are supposed to serve the public as well as MPs. What is so secret, anyway, about the number of staff employed by MSD? This one is uncooperative and obstructive. 8668 (2008). Hon Annette King to the Minister for Social Development and Employment (12 Dec 2008): In light of the Government’s statements about an “underclass” in New Zealand, What is the Government’s definition of an underclass? Hon Paula Bennett (Minister for Social Development and Employment) replied: The Government's overall priorities for this parliamentary term are set in the Speech from the Throne which is publically available via the beehive.govt.nz website. I am currently in the process of further developing and confirming my priorites for the Social Development and Employment portfolio. This is also my response to written parliamentary questions 8669 (2008). 8590 (2008). Hon Annette King to the Minister for Social Development and Employment (11 Dec 2008): What, if any, additional funding will she be seeking for effective parenting programmes such as Family Start and Strategies with Kids - Information for Parents (SKIP)? Hon Paula Bennett (Minister for Social Development and Employment) replied: Information on funding being considered as part of future Budgets is Budget Sensitive. Any decisions will be announced at the appropriate time. This is also my response to written parliamentary querstion 8591 (2008). Yes, yes. Just par for the course. Just what Labour would have done. No big deal. Only I thought the National government was going to be a cut above. Is anybody else really bothered by this? I have been against DNA sampling from people who are mere suspects of a crime from the outset. How far afield can the suspicion net be cast? And the establishment of a DNA link is not necessarily conclusive. DNA can be present for reasons other than the suspect committed the crime. DNA technology has probably improved but anyone who watched the David Dougherty story at the weekend should be concerned about the misuse of DNA evidence which saw this man wrongly imprisoned for years. It's really, really bugging me that National are going to pass this legislation. WITH the support of ACT. "Youth culture dumbs down teenagers"
Based on just the information provided by the NZPA (the study is not on-line yet) Jim Flynn's latest research appears to contradict his earlier. Professor Flynn says English teenagers are dumber than they were 28 years ago. Professor James Flynn, of Otago University, found that IQ scores for the average 14-year-old had dropped by more than two points between 1980 and 2008. For those in the upper half of the intelligence scale, average IQ scores were six points down on 28 years ago. The study contrasts with Professor Flynn's previous work, which suggested that intelligence has been consistently rising among all age groups in industrialised countries. Of course, it could just be that the English are getting thicker. I am sure Theodore Dalrymple would be a subscriber to this theory. Professor Flynn suggested that the falls could be down to lifestyle changes, including more time spent in front of the television or playing video games. "Other studies have shown how pervasive teenage youth culture is, and what we see is parents' influence on IQ slowly diminishing with age." Even if the tests are robust, the sampling robust, blaming youth culture seems rather weak. Youth culture existed before the 1990s. I misspent my youth on a diet of Casey Kasam's American Top Forty for instance. Perhaps Mr Flynn's earlier laments about less educated women having a greater proportion of children (a predictable outcome of welfarism) hold more promise of an explanation. But after the uproar he caused last time he went there, it is safer to look for other factors to blame. Archbishop David Moxon has told an international press conference that the Anglican Communion should offer “moral leadership” in the campaign against global warming. Archbishop Moxon is in Alexandria, Egypt, for a meeting of the Anglican Primates, or leaders of the 34 Anglican provinces that make up the worldwide Anglican Communion. Archbishop Moxon later told a press conference that the gathered Anglican leaders were agreed that the Anglican Communion should offer “moral leadership” in the campaign against climate change. This, he suggested, was significantly a matter of setting an example. He spoke of the need for Anglicans to embrace lifestyle changes, and to cutback unnecessary or environmentally hazardous modes of travel. Rattled passengers were told not to take photos as fuel streamed out of the wings of an Air New Zealand jet bound for Los Angeles. Flight NZ6, with 365 people on board, was forced to turn back about 20 minutes after leaving Auckland on Saturday night when the pilots were unable to retract the landing gear. 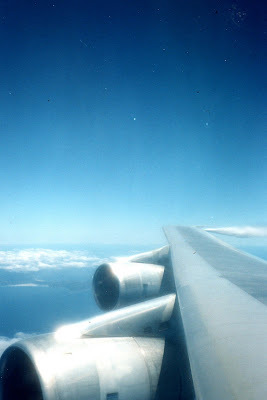 In the 1993 David and I were on a 747 bound for Japan from Auckland. About 30-40 minutes into the flight I said to David, "We have been in a very shallow right hand turn for the past few minutes. Wonder what's going on." A radio announcement shortly followed. It was explained that the Captain's cockpit window had developed a 'bubble' and we were returning to Auckland for a precautionary landing. 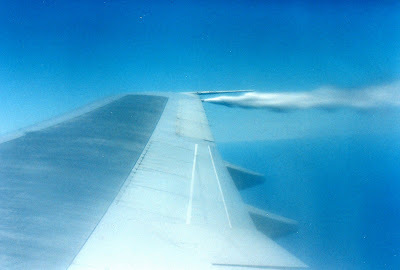 But before we could land we would be dumping fuel and what to expect visually. Nobody instructed us not to take photos, albeit these were the days before widespread digital image communication. As I recall on the flight I was on, there was more a sense of curiosity than fear. Instructing people not to take photos would have fostered a sense of alarm. Perhaps they were simply trying to minimise bad publicity. So if you wanted to know what you missed, that's what tonnes of fuel being jettisoned off the East Coast of Northern New Zealand looks like. I have been following this story from Kismet Farm.First instalment and second are a good read because the writer has a sense of humour but don't go there if you have blood pressure problems. Not quite on this scale but we have also experienced the incompetence and rudeness of local council. It must happen over and over (notwithstanding I have also heard of good experiences.) I would advise these people to enlist the support of the Minister for Local Government in their battle. The time is ripe.